Creo 6.0 makes you more productive than ever. It’s packed with new enhancements and capabilities to help you innovate and design the products of the future faster. From enhanced core modeling capabilities to real-time simulation and collaboration via augmented reality (AR), Creo can put you ahead of today’s deadlines and in a position to capitalize on tomorrow’s opportunities. And only PTC brings you these capabilities deeply integrated into the industry’s best modeling and assembly engine – Creo. Augmented Reality is changing the way companies design. From how you view and sharedesigns, to how you securely collaborate with colleagues, customers, suppliers and stakeholders across the enterprise, to accessing your designs anywhere, anytime. And in Creo 6.0, our cloud-based AR is getting even better. Now every user can publish and manage up to 10 designs, controlling who has access to each experience, and easily removing old ones at will. In addition, you can now publish experiences for use with HoloLens. Creo 6.0 introduces real-time simulation with Creo Simulation Live, powered by ANSYS. Now you can get real-time guidance on design decisions as you make them. 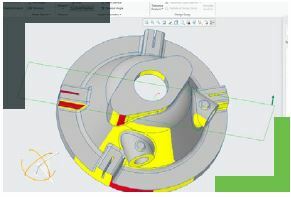 Creo simualtion Live runs in the background, providing instant feedback as you make changes to your design. No need to simplify geometry, create a mesh, or move between windows. 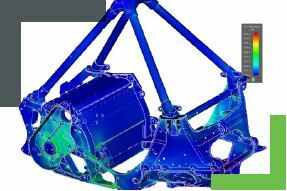 Creo Simulation Live works on parts and assemblies, providing structural, thermal and modal analysis so you can iterate more quickly, consider more options, and design with greater confidence. *Please note: ANSYS-powered products are not eligible for remix or restack. 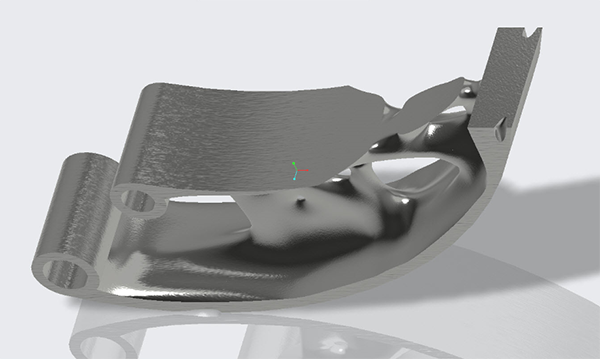 Creo 6.0 is adding new capabilities to give you greater flexibility when you design for additive manufacturing. 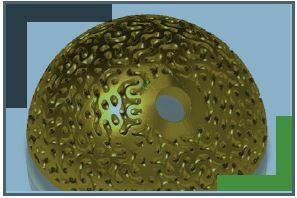 More Lattices: In addition to the standard 2.5 D and 3D lattices, you can now build formuladriven lattices, such as gyroids, stochastic foam or conformal lattices, and define your own custom lattices using Creo geometry. Build Direction: You have the ability to analyze and optimize build orientation to minimize print time, minimize support structures or maximize tray utilization, and leverage this orientation to drive the lattice design. Optimization: Creo 6.0 supports assemblies in Topology optimization. In addition, Creo 6.0 offers an improved results window with more controls to enable you to interrogate and animate the result more thoroughly. Creo continues to make you more productive and your daily work easier. Model tree improvements – the model tree is now aligned more closely with the graphics area. Nonactivated components in the assembly will have reduced visibility matching the graphics area. Any customizations made to the model tree are now automatically stored, ready for the next time you open a model. Updated skin and dashboards – dashboards have been enhanced to group functions more clearly and also include direct access to help information for that feature. An in-feature mini-toolbar gives you the ability to execute feature options inside the graphics area without moving up to the dashboard. Cable ties and markers – modernized and streamlined interface for adding markers and cable ties. Continued volume sweep, enabling you to generate the curve that the tool follows to drive the CNC machine. Model Based Design continued expansion, – modernized notes interface allow for simpler and more intuitive placement of notes on your model. Notes now understand the geometry and annotations with which they are associated. Creo is a 3D CAD solution that helps you build better products faster by accelerating product innovation, reusing the best of your design and replacing assumptions with facts. Go from the earliest phases of product design to a smart, connected product with Creo. And with cloud-based augmented reality in each seat of Creo, you can collaborate with anyone, instantly at any step in the product development process. In the fast-changing world of the Industrial IoT, no other company can get you to substantial value as quickly and effectively as PTC. © 2019, PTC Inc. (PTC). All rights reserved. Information described herein is furnished for informational use only, is subject to change without notice, and should not be taken as a guarantee, commitment, or offer by PTC. 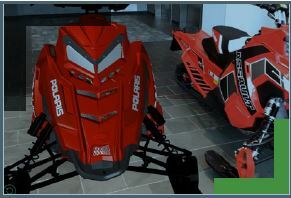 PTC, the PTC logo, and all PTC product names and logos are trademarks or registered trademarks of PTC and/or its subsidiaries in the United States and other countries. All other product or company names are property of their respective owners. The timing of any product release, including any features or functionality, is subject to change at PTC’s discretion.